Dolphin Trainer for a Day in Coffs Harbour! It had been 3 and a half years since my partner & I had had a REAL holiday. September 2012 was the plan we made at the end of 2011. Where to go? I have been a dolphin lover for as many years as I can remember. I have sponsored a dolphin in Bunbury for over ten years, so the original plan was to holiday in the Perth area and visit my adopted dolphin at that time – Tangles. However, I received a newsletter in March to say that Tangles had not returned to the bay since December 2011. I then looked into the Coffs Harbour Dolphin Marine Magic adopting program and adopted my beautiful little Bella. This got the excitement growing within and so I booked a room at the Wyndham Coffs Harbour – Terraces for our September holiday – we were going to visit the dolphins. 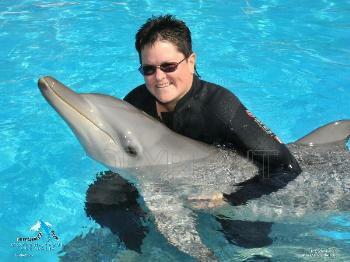 I then went onto the Dolphin Marine Magic website to find out what I could do whilst we were there. I booked a shallow experience with a dolphin and purchased an annual pass as I knew I would do more than 3 visits during our stay. Pam is not a water lover and at the booking stage, said she would just go along and take photos etc. As our holiday drew closer and closer, my family and friends, I think were getting annoyed with me constantly giving them countdowns in months & days etc. September 7th finally arrived, we were up and out of bed with so much energy, packed the BT50 and set off on our journey from Townsville NQ to Coffs in NSW. We had planned a few stops along the way to visit friends and go to the Outback Spectacular on the Gold Coast, which was totally awesome. We arrived at Wyndham Coffs Harbour at 3pm on Monday 10th Sept., our room was not quite ready, so we waited in the very comfortable lounge at Treetops (Ed’s note: Check-in for Club resorts is 4pm). The receptionists, Karen & Jay were extremely friendly and asked us what we had planned for our holiday and we chatted for quite some time. We also had the most scrumptious Chai Latte from the ‘Stella” coffee machine in the Owners Lounge – highly recommended for ALL Wyndham resorts. Our room became available around 4pm and off we went. The apartment was amazing, two bedroom unit with a wonderful view. Of course there only being the two of us, the second bedroom became our luggage storage area, very handy. The next 10 days at Coffs were the MOST amazing days of our lives. 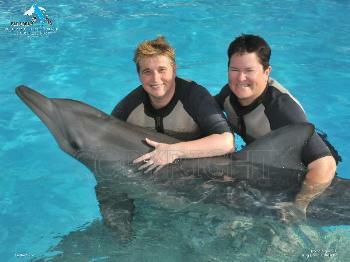 My swim with the dolphin experience was on the Wednesday and WOW what a fantastic, awesome experience it was. I spent 40 minutes in the water with Jet, Bella’s brother, and his trainer, learning so much about this wonderful creature. It was just extraordinary. I think even Pam was envious, as she watched from the side of the pool, taking over 500 photos. After the swim, Bella’s trainer, Mel asked why we had not booked to be trainers for the day. I was unaware that we could do such a thing. So on returning to the booking desk, where the lovely Robyn was always so helpful, we asked for more info on this new experience. I was rapt and of course wanted to sign up there and then, however it was a little expensive and we did not know what other sight-seeing in the area was going to cost, so we just said that we would let them know in a few days. We spent the rest of the week visiting other attractions, such as the Big Banana and all nearby beaches. We drove back to Grafton and up through the mountain ranges to Nymboida, where we visited a museum owned by Russell Crowe and had a very enjoyable good old country lunch at the pub next door. He owns the entire site, which is a must for any tourist to visit. Over the weekend, Pam and I deliberated on doing the Trainer for a day and finally we said, hang the expense – the experience cannot really be measured in monetary form any way. So we called into see Robyn and booked for Wednesday. We also went whale watching and more sight-seeing around the beautiful area surrounding Coffs Harbour on the days prior to the trainer day. Finally, the day to surpass all other days. We started at 7.30am, filling bait buckets for the dolphin & seals. During the day we had the privilege to walk the seals around the park, and fed the little penguins. Hurt & sick sea turtles are cared for at the centre and we were scrubbing moss and picking barnacles from their shells. The whole day was just so amazing, we would recommend this experience to everyone. The day finished with being able to spend an hour in the water with my baby Bella and a seal called Ozzie, with their trainer Mel. Pam even got into the water, as the entire experience had totally overwhelmed her to do so. She was in awe of the magically feeling it was to enter the water with these incredibly intelligent animals. We have got lots of photos – but most of all fantastic memories of a long waited holiday – totally worth waiting for. Explore Wyndham Coffs Harbour – Terraces (NSW) on your Owner website. This entry was posted in (NSW) Coffs Harbour and tagged australia, Coffs Harbour, dolphins, holiday, new south wales, travel, vacation ownership, WorldMark South Pacific Club by Wyndham, Wyndham Vacation Resorts Asia Pacific. Bookmark the permalink.